As an Instagram sensation, Tammy Hembrow, 24, is no stranger to receiving cruel messages from online trolls. And on Monday, the fitness queen hit back after a fan claimed she looked ‘bloated’ in photos taken at the Bondi Sands Coachella party in Palm Springs, California. ‘She looks bloated’, the troll commented underneath two images of Tammy playfully posing next to a rocky crag outside the VIP event. 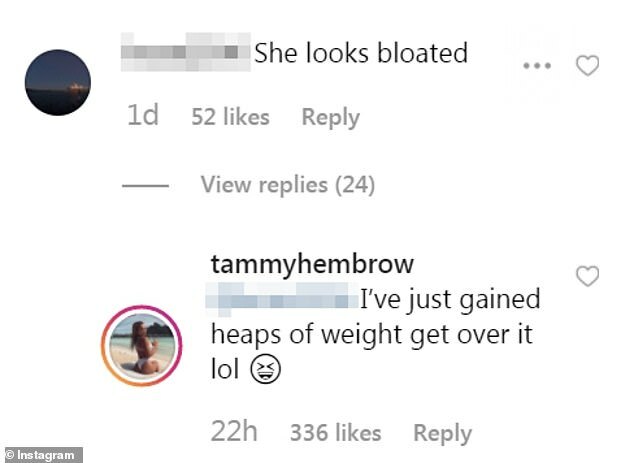 Rather than ignoring the remark, Tammy responded: ‘I’ve just gained heaps of weight get over it lol’, alongside a laughing emoji face. Tammy’s response received an astronomical 336 ‘likes’ in less than 24 hours. It comes after a video has emerged on an Instagram fanpage in which a friend of the Australian influencer revealed she’d broken her ankle. ‘Tammy’s literally got a broken ankle, so she’s going to Coachella on crutches,’ the female friend can be heard saying off-camera. While Tammy appears in the video, she isn’t seen on crutches, but appears to be in some pain as she limps from side to side. Over the past five years, the Saski Collection founder has become an Internet sensation thanks to her dramatic body transformation and ‘clean eating’ lifestyle. Speaking to New Idea in 2017, Tammy revealed she trains three to five days a week and prefers a combination of HIIT, weights and cardio. She also emphasised the importance of eating protein-rich food and complex carbohydrates to maintain her flawless physique. ‘For me lean protein like chicken breast, turkey and fish, really helps, but I find that with trying to build my booty I wasn’t consuming the amount of protein I needed so supplements like protein shakes helped too,’ she said.